Three more men have been ordained as priests for service in the Personal Ordinariate of Our Lady of Walsingham. Fr Kenneth Berry, Fr Paul Gibbons, and Fr Donald Minchew, were ordained to the sacred priesthood by the Archbishop of Southwark, the Most Reverend Peter Smith, on Saturday morning. During his homily to a packed church of Our Lady of Reparation, West Croydon, Archbishop Smith recalled the particular ministry of the ordained priest in the service of Christ and his Church. Fr Minchew and Fr Berry served as Anglican clergy at St Michael & All Angels, Croydon, which is across the road from the church of their ordination, and will now lead the Croydon Ordinariate Group. Fr Gibbons served in Maidstone where he will now serve the Ordinariate as pastor to a group of faithful there. Amongst the clergy present at the ordination were the Ordinary, Mgr John Broadhurst, Mgr Edwin Barnes, Mgr Robert Mercer, and Ordinariate priests resident in the Archdiocese of Southwark. They were joined by local diocesan clergy and by a seminarian of the Blessed Sacrament Fathers from Liverpool, who as a young Anglican was encouraged to consider ordained ministry by Fr Minchew. A spokesman for the Ordinariate said, “Today we witnessed the ordination of three men whose lives have led to this point – the fulfilment of the call from Christ to serve him as priests of the Catholic Church. As priests of the Ordinariate, serving the local community and the wider Church, their fidelity to a vision for unity and truth has been borne out; they now continue the task of proclaiming that vision to the world”. After the Mass, a celebratory luncheon was given in the parish hall, joined by the Ordinary and the Archbishop. In via a comment here. There is an independent jurisdiction in Australia titled “The Continuing Anglican Church in Australia” (CACA). This jurisdiction is awaiting the consecration of its first Bishop. The clergy of the CACA are formermembers of the ACCA. Those clergy and laity of the ACCA (TAC) who do not intend to enter an Ordinariate would do well to consider joining the CACA.They would be most welcome. The above raises more questions than answers. Consecrated? Who and by who? What of the validity of orders (if any, and if that still matters). Why form yet another Continuing body? There is a TAC still. Splits and splinters lead only to more splits and splinters. With whom are they affiliated? Is the above a work of the Holy Spirit or of man? Until October 2010 our parish was part of, and was affiliated with, The Anglican Catholic Church in Australia. As a result of that church deciding to enter an Ordinariate, if and when one is established for Australia, our parish withdrew from the church as we do not wish to become Roman Catholics. Our very existence proves how wrong those were who said that there could not be such a thing as a “continuing” Continuing Anglican Church! While we do believe that it is the Will of Jesus that all Christians should be one, we do not believe that this necessarily means that all Christians have to be Roman Catholics. We cannot, in conscience, believe certain dogmas held by the Roman Catholic Church. That being the case, we do not believe that it is the Will of the Holy Spirit that we should compromise our consciences. It has been said that Fr Brian has “created” a “newly constituted church”. He’s not quite sure how preaching and teaching good old fashioned orthodox Anglicanism can be considered to be the creation of a new church. So is he soon the be the Bishop? I can but pray that he and his people be reconciled with the TAC and function in a post-Hepworthian Church. Or get it in pdf. here. Over at the American Schools of Oriental Research (ASOR) blog. How exciting! It’ll be well worth following. Updates will be made here. UPDATE: Information is now emerging on a The Continuing Anglican Church in Australia. After Anglicanorum coetibus was made public, a very helpful blog came to prominence, called The Anglo-Catholic. It served as a kind of “information central” so people could learn more about the Holy Father’s vision for Ordinariates, and it explored aspects of our Anglican patrimony through some very interesting articles. When I was invited to be a contributor, I was pleased to accept. Since then I have contributed scores of articles, and have thoroughly enjoyed it. Contributions from participants on the blog included speculation, anticipation, some pretty serious scholarship, and even some off-the-wall statements. It was all great fun, but it also served the very important purpose of building a sense of community among those who were interested in “all things Ordinariate,” and who appreciated the generosity of the Holy Father. As the Ordinariates came into being – first in England, then in the United States, and most recently in Australia – the purpose of The Anglo-Catholic became a bit unclear. There was no more need for speculation, because what had been anticipated now existed. The blog could serve as a kind of cheerleader, but even the most dedicated cheerleaders can’t go on forever. It could be a place for reposting news articles and other blog entries, but most people would have already seen those things. It could be a place where commenters could share their thoughts, but commenters often go down paths which someone else might think is unhelpful. The respective Ordinariates have their own websites, and are perfectly capable of publicizing what their leaders wish to make public, so The Anglo-Catholic would be mere duplication if that was its purpose. I thought that was pretty clear. Apparently, however, there are blanks demanding to be filled. But honestly – there’s no juicy filling to be had, and I can assure everyone that there was absolutely no outside pressure to put the blog on hiatus. However, there have been speculations about why I have pulled back from things. Please – let me expose some of them, and put them to rest. It’s been suggested that I’m upset because our parish is not part of the Ordinariate in this country. That is untrue. In fact, we have remained as a Pastoral Provision parish in the Archdiocese of San Antonio by our own choice. The archbishop was willing to work out the practicalities of our move into the Ordinariate, but I asked him if he would have any objection if we chose to remain. Needless to say, he had no objection whatsoever – and, in fact, he expressed his delight about our staying. I made that request because the Ordinariate of the Chair of St. Peter is new, it is fragile, it is very small, and it is trying to settle itself. 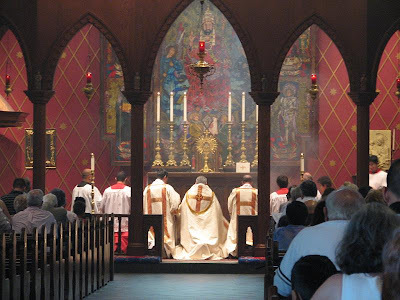 On the other hand, our parish is nearly thirty years old, it is well-established, it has a major school, and its membership is many times larger than the present composition of the Ordinariate. It’s even been suggested that I’m off in a corner, isolated and angry because I wasn’t given a position of responsibility in the Ordinariate. Please put that idea to rest. I had the privilege of being appointed as the founding pastor of Our Lady of the Atonement Church in 1983, and I observed my 29th anniversary as pastor just a few weeks ago, on August 15th. It is my dearest hope to remain as the pastor of this parish until I retire, many years hence. As I mentioned in my final posting for The Anglo-Catholic, I have the pastoral care of nearly 3,000 souls. I am administering a parish with more than 60 employees, and with a present annual budget in excess of $5 million. I’m not crazy. I know myself well enough to realize that this task is plenty big enough for my limited capabilities, and I have no desire to be doing anything else. Being the priest in this parish is the highest and best calling God could give to me, and I’m thankful to Him daily. For all of the twenty-nine years of my priestly ministry I have been incardinated as a priest of the Archdiocese of San Antonio, and my heart is no place else. Believe me, I’m not living in isolation! The canonical erection of Our Lady of the Atonement Church in 1983 was ground-breaking. Our parish, in union with the other Anglican Use parishes, established a place in the Catholic Church for our Anglican patrimony, and we will continue to maintain that identity. The existence of the Ordinariates is a vindication of the pioneering work done over many years by men greater than me, and my role in helping to bring it to fruit is a privilege I treasure. If our experience can be of any help in strengthening the Ordinariate in this country, we’re ready and willing; if our remaining outside the Ordinariate is more helpful, we understand. After all, we’re preaching the same Gospel, and we’re ministering the same Sacraments – and all the while we’re maintaining the same Anglican patrimony. In the context of the big picture, the jurisdiction in which we’re doing it is only incidental. And don’t forget to follow Fr Phillips’ blog here.